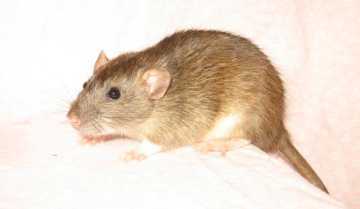 Bray's in Moose Jaw is one of the few small pet stores that I will support due to their love and care of the rats. The employees love the rats and they can't get enough of handling them. One of the employee's mother comes to the store just to handle the rats on a daily basis. They also separate males and females, at the right time, at the store. They had two "oops!" litters due to the out-of-town shipper sending both sexes together in the same package. I guess I was on the rebound on December 20,2004. Holly died, Deej was dying. I was so utterly depressed I decided to go to Bray's and watch their rats for awhile while I was in town. I came home with four, nine-week old rats on that day. The name Alfi had been stuck in my head for awhile now, I just had to find who this Alfi was? These four are brothers and sisters from the same litter. On January 07,2005 I had to go to Bray's to get food for my Tiger Salamander and the other "oops!" litter was out on display. 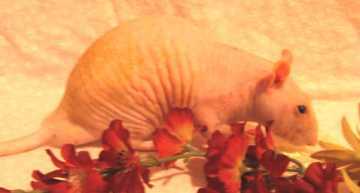 I came home with Eve, my first naked rat. Eve was only four weeks old. Normally the store's policy is not to sell a rat before five weeks old but they know my ratty reputation, and they know that I have the ability to properly care for this little one. THEN, on January 11,2005 I had to go back at the store to get more food for the Salamander and now all of the babies are out on display in a huge tank. I ended up staying for over an hour handling these babies and putting on a good show of Ratty PR for the other customers that came in. I made the mistake of handling a four week old boy, Eve's brother. This little boy sat in my hands and had no intentions of wanting to get back to the cage. This little fuzz-ball was so gentle, so sweet. He checked me out, gave me kisses, sat in my hands and groomed himself, bruxed, licked my hands,............ how could I say no? Personality: Nothing really outstanding. He's a rat's rat. Friendly, curious. As an adult, Alfi is small for a male. Built like a greyhound. Personality: Nothing really outstanding. He's a rat's rat. Friendly, curious. Bowen is quite nibbly and can get rather rough. As an adult, Bowen is small for a male. Built like a greyhound. Personality: Friendly, curious. She's just like a rag doll when you hold her. Like putty in your hands. As an adult, Caprice is a very small, petite girl. Personality: Nothing really outstanding. She's a rat's rat. Friendly, curious. As an adult, Deja is a very small, petite girl. Personality: My goodness Eve is feisty. She gets what she wants, when she wants it, and she can barrel down even the oldest of the youngsters. 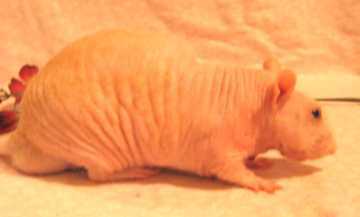 She's so tiny, naked, and wrinkly. She reminds me of a cross between a human baby and a little alien. Alfi, Bowen, Caprice and Deja are Eve's cousins. As an adult, Eve is a very small, petite girl. Personality: I named him Farrell, which sounds like feral, wild, because he is the complete opposite of what the name implies. Alfi, Bowen, Caprice and Deja are Farrell's cousins. 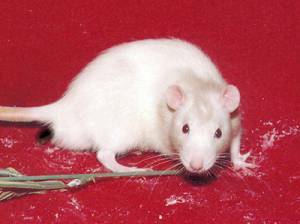 February 23,2005, I just went to the Humane Society to renew my membership and as soon as I found out that they had rats up for adoption, GMR (get more rats) struck me. I came home with two young naked boys. I'm told they are about two and a half months old. I'm torn though, about the five-six month old single naked boy I left behind. The two youngsters were caged separately from the older one. They could only tell me that the rats were surrendered and had no other info for me. The older one's cage mate found a home without him. He was left behind because he instigated fights and drew blood. I can't take on another lone male at this time. Now I sit here broken hearted, grieving for the one I left behind. I have time to think about adopting him, I hope. Update: I was told that the lone male died in his cage. Personality: Bolder of the two brothers. Definitely the Alpha. His name is pronounced, "Gay - Len"
Personality: Follows his brother around like a pale little shadow. Very friendly, he licks my hands. In October of 2005 Halen suffered hind-end paralysis but recovered fully with the help of Homeopathics and Physiotherapy. His death, at this time, is a mystery to me. He appeared to be in perfect health. One of the employees of Bray's, Tanya, has bought out the pet store and appropriately, changed the store's name. 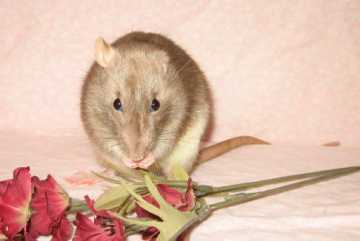 Her mother, Gerry, has been employed and, in the process of having been their go-between in getting them some quality breeder rats, we are all becoming really good friends. I visit P4P every payday now to hang-out and chat. 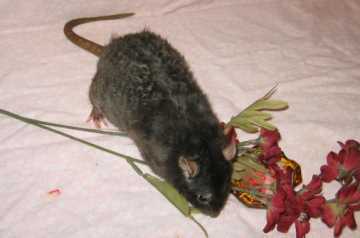 I handle the rats and put on some really good ratty PR for the customers. 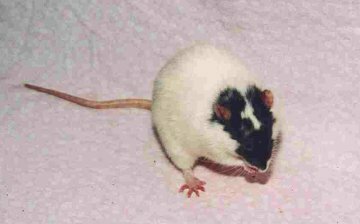 P4P still have two rats left from their last (and never again) pet-mill rats. A lone male and, and in the back room, a lone female. They tell me that something is wrong with the female. She grooms her hips too much and has left porphyrin stains over both hips. They can't pin-point the problem, but she doesn't seem to be all there mentally, and so they are keeping her away from the other animals and under observation. She's been in quarantine for about three weeks now, and there have been no changes, good or bad. The lone male has been on display in the store. Both rats have been there for a long time. I did find out that the lone female started "going mental" after her only cage mate was sold. I was in the store on Friday, October 07, 2005 and Gerry said that someone wanted the boy but they actually wanted two rats and they haven't heard back from them. I told Gerry that I would be back on Tuesday, and if the rats were still there, I would buy them. So I went back to the store on Tuesday, October 11, and the rats were still there. Gerry told me that on Saturday some fellow came in and wanted the lone male for snake food. Of course Gerry said no. Actually, she never said the word, no. She put the ratboy that she was cuddling back into his cage and just walked away from the man. 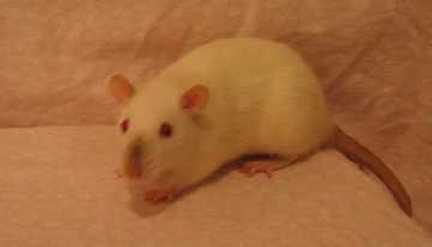 I offered to pay half price for her if they let me have the girl, but P4P sold me both rats at a reduced price. Update: Jana is a perfectly normal rat girl and stopped the over grooming when I introduced her to other girls. I think she was lonely and stressed at the store. I settled on the name I'rat. In playing around with the name it sounds like the Movie, "I Robot". And then I would pick him up and, holding him up so we are seeing eyeball to eyeball, I found my saying, in my best Arnold S. accent, "I be Rat". Oddly, he puts up with this as the good-natured guy that he is. He's quiet, and sweet, but shy. Personality: She's out-going, personable, and quite the character. She's one my toe-nippers, foot-pee-markers, when she's out free-ranging. Jana had been spayed when her pregnancy went horribly wrong. October 23,2005: I went to the Auction with friends, Deb and Rob of DreamQuest Rodent Ranch. 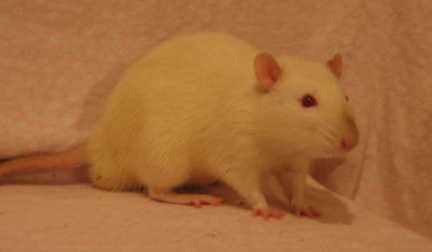 The three rats that I got at the Auction today are all boys, not girls as I had originally thought. They were so cold and scared that I didn't see testicles upon first looking at them. Should have taken them out of the cage to handle them but I didn't know if I was allowed to do that. Their coats are course which I believe is normal for a male rat older then six months, which I'm guessing their age is, but these boys still need some TLC and good food to get them back into a better condition. They've been scratching and sneezing since I got them home. You should have seen the cage, and condition, these boys were in at the auction. I should have taken a picture of the cage that they were kept in. I transfered them to a better cage at home and Deb offered to dispose of the decrepid one for me, so my husband wouldn't suspect. Deb busted the cage into a million pieces putting it into the trunk of her car. The cage was an old, small, hamster cage. The wire top was totally rusted, the plastic bottom was dirty, broken, and cracked. In several places it was held together with duct tape. I was actually wondering if I was going to get the rats home before the cage disintigrated and fell apart on me. I had to carry it very carefully. The rats were huddled together, trying to stay warm as they were outside in a stall. It was very cold this morning. I told someone to bring them inside and put them on the table under the warm lights with the rest of the small animals. I said that I couldn't bid on the animals if they were all hunched up and looking sick. He mumbling under his breath that the rats looked perfectly fine to him, but he did bring them inside. I have no idea how long the rats had been there in the stall but they had no water and a little bit of meow mix cat food. So we watched as one fellow used his pen to poke at the rats. Some people were talking about the rats and I heard words that were both pleasant and not so pleasant. And I was stunned and near tears when I saw an elderly gentleman open the cage and gently pet one of the rats. With Deb's help I did a much better job of placing a bid this time. Deb kicked me in the shin when it was time for me to throw my hand up (jus' kiddin'). It happened so fast that I actually thought I lost the bid to someone else. Got the 3 boys for $10.00. I found out later that I was bidding against someone who wanted the boys as raptor food. We didn't stay after we got our rodents. Deb got hamsters. It was so crowded in that building that I felt like we were packed in like sardines. We were out of there by 1:45pm. These boys look so much like Bowen that I swear they must be related somehow. They look like they could be brothers. Personality: Outgoing, curious. He likes to check me out as if everytime we meet is the first time. 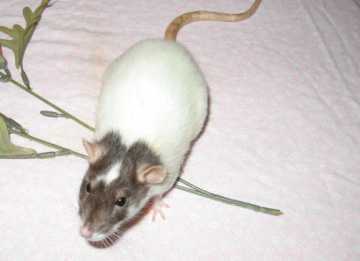 November 29,2005: I have two new rats. I have a one-eyed girl, why not a one-eared boy. 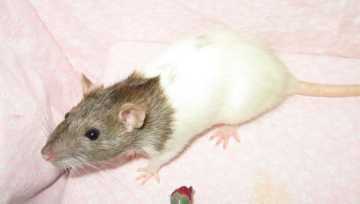 It came to my attention via Sask_Exotics (a Yahoo group) that Petland has a one-eared rat in the store. Thank you Candace for organizing my ability to get this little ratty. So through today's blizzard, a friend drove us ever forward to our Regina Petland destination at 9:30am. And thanks to Theresa, An employee and a rat-lover, whom I talked to for what seemed like an eternity, as I filled out the required adoption papers. 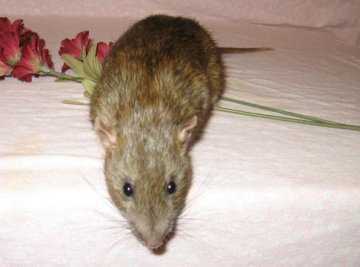 Theresa had a special rat in the group, but was unable to adopt him because her family did not appreciate rats as pets. Under the rare instance that Nibbles is unable to intergrate with the other boys he would need a companion so I told Theresa that I could give "her" rat a home. So as I'm putting the boys into a cage that I had prepared for them at home, there was something that I did *not* see on Nibbles. So, I lifted the tail and saw, nothing. 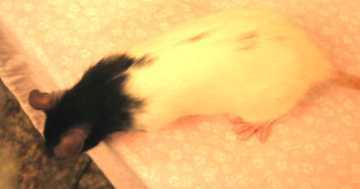 Nibbles, is a girl! 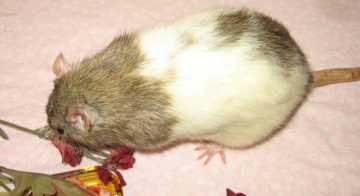 I was led to believe that this rat was a boy? 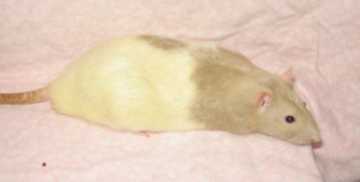 This is the first time I have known Petland to mix the sexes of their rats and that means Nibbles might be pregnant. I'll have to cross that bridge if we come to it. Nibbles, does indeed, have only one ear. The ear hole is perfectly formed, looks perfectly normal. It's just the pinna that's missing. Looks like a birth defect because there's no sign of it being chewed or torn off. 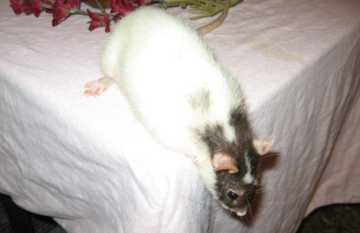 I am told that the rats have their adult coats, or at least their coats have not changed since they got them in. I'm guessing their age to be at least three to four months old. Don't think they are related. I named Nibbles/Nibbs after a friend's Jack Russell Terrier. Theresa named "her" rat Oggy. I had told Theresa that they will shortly be selling pregnant females to their customers and to separate them ASAP. Could be too late for some of the girls. Update: I was right. Petland is inundated with pregnant rats and more litters then they know what to do with. December 29,2005: While visiting P4P do not play with the rats, do not play with the rats, do not play with rats. Dang! I played with the rats, and this one told me his name. 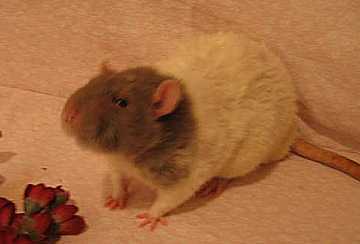 February 07,2006: I had told a friend that if she couldn't find homes for any of the babies in her rat's second litter, that I would take them. I made arrangements for her to deliver two baby boys to me today. They are five weeks old. These babies are from one of the two females that I gave to this friend from the last SBR rats, because she was my ride to and back from Regina. One of the girls was killed by her dog. The surviving girl, Willow, has had 2 litters in a row. 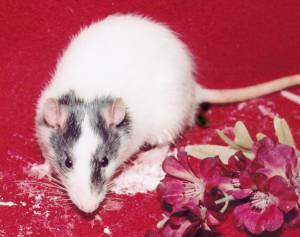 The first litter was planned, much to my dismay because these SBR rats had Myco flare-ups at a very young age. The father was a black hooded boy named Spike. The second litter was accidental by Spike, and Willow is pregnant with her third litter by accident by her own free-ranging son, Xander. The only good thing is that Willow has only three babies in each litter. I'm disappointed. I didn't know it was going to be this way when I gave her the rats. Lousy cages, and rats that won't stay in them. I told her this is how I started out, and to learn from my mistakes. I can afford my rat-obscession. She can't afford to be obscessed, with the family's lack of income, and they both have to work. I can tell that my friend is getting tired of all this, and she's run out of people to give babies to, so she might be learning. Oz will have his name changed to Q. just getting my love for Star Trek in there once again. Doyle will have his name changed to Rowden't. Just a play on the word, Rodent. Personality: Well socialized and easy to handle. Sweet and gentle as can be. Typical rat boy, complains when I pick him up. Personality: Well socialized and easy to handle. Sweet and gentle as can be. Typical rat boy. Rowden't, the "t" is silent, or not. He is so black that the only pink on him is the base of his ears, the tips of his toes, and a teeny-tiny pink tip on his tail. I had reserved 6 week old Sindi on February 27,2006, my birthday present to me. 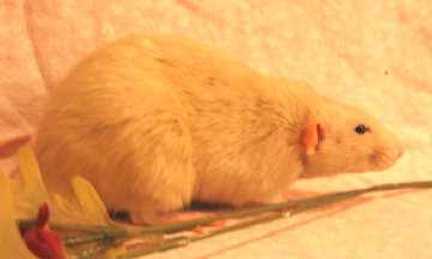 We had plans to go back home to Vancouver Island March 07 and now was not a good time to bring a new rat into the colony. P4P held onto her for me and I picked her up March 21. Gerry was my pet-sitter while we were gone, and she did an an awesome job of looking after the rats. Gerry wanted to give me another girl for free. Her name was Girly and she could neither be bred nor sold because of a skin problem. Girly is Deja's sister. Sindi is related to Dotti and Ratsami as a niece on his side, out of DQRR Blue Girl, Ratsami's sister. I changed Girly's name to Tric. Her name is pronounced "Trick"
I answered an ad at DiscoverMooseJaw.com. 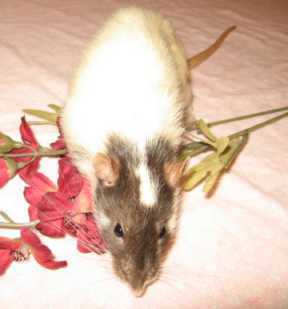 Due to life-style changes a family needed to rehome their two male rats. 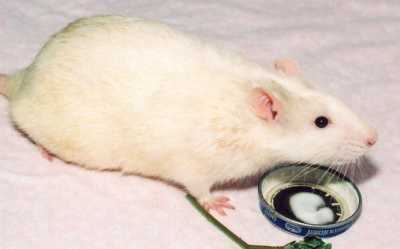 "Two White/gray domestic pet rats...The little brother rats come with....."
So I went to their house on March 26,2006, at 3:00pm, to pick up the boys. The rats were not boys, they were girls. For over a year the family thought they had males and had named them Ranger and Nicholas. I discovered, as we talked, that the girls were purchased at Bray's, and they are sisters to Deja, Caprice, Bowen, and Alfi. These girls had also developed that same skin problem that Deja suffered from but the lady was bathing the girls once a month in a home-made, holistic shampoo, and it was working. As I was leaving, I thought I heard what sounded like the Myco clicking sound coming from Ranger. I didn't tell them this as I didn't want to needlessly worry them. I'll just take care of this as best I can. Myco was confirmed when I arrived home and had a chance to watch and listen more closely. So I was calling them Ranga and Nicky for awhile, and eventually changed their names to something ultra feminine. Ursa has a very interesting coat texture. 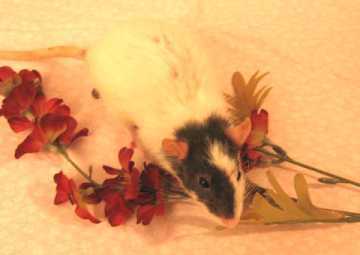 She's a standard-coated rat but her coat feels thick and plush. 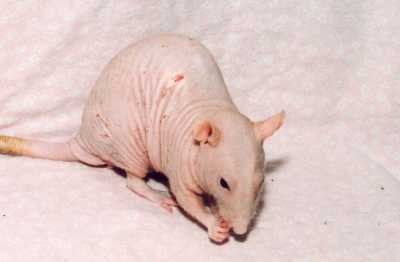 I don't know if this is natural, or the result of the use of a holistic shampoo that they used to bathe the rats. 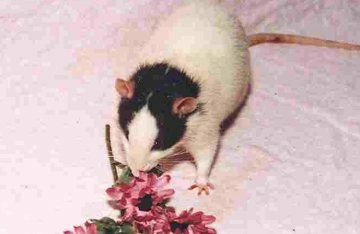 Personality: Busy little girl as rat girls are. No time for me, too busy. Bad, Bad, Bad, rat! P4P does not sell rats, they sell Brats! Wisteria is in with Dotti's girls, and she looks so tiny and delicate among these big, boofy, Dumbo girls, like a wisp of a breeze among the boulders. This is the first time I have ever seen an almost solid Agouti rat. Very pretty, very wild looking. Somebody had a litter of rats and didn't want to keep the babies, so they turned them in to DDK. They had dumped the litter off when they were only 3 weeks old, and without their mother. Xylia was only four weeks old when I brought her home May 02,2006. Xylia is the only Dumbo in the litter. Her name is pronounced, "Ex-ee-lee-a"
Well I'll be. I brought Xylia home thinking I would never see another Agouti like her again. 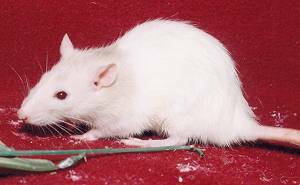 P4P now has a litter of rats that look like Xylia. Their mother is Caramel, a Fawn Berkshire Top-eared Doe and their father is Oreo, a Black Hooded Dumbo Buck. 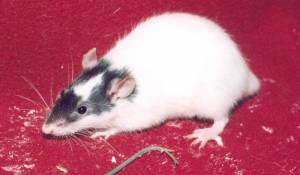 Both rats are breeders at P4P.